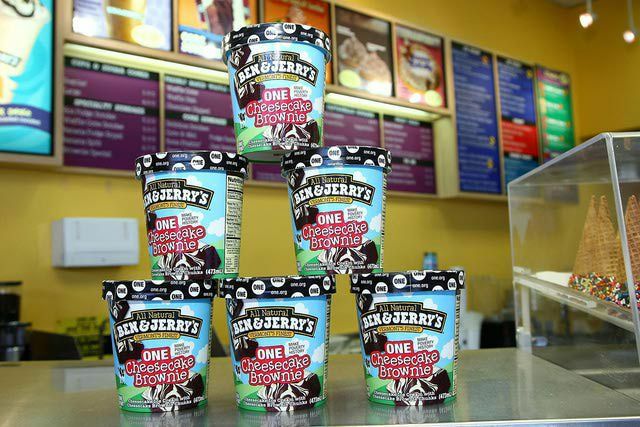 Ben & Jerry's is the premium ice cream maker behind such favorites as Cherry Garcia and Chocolate Chip Cookie Dough. But, do you know Ben's and Jerry's favorite flavors? What was their biggest argument? Are there cool perks to working at the company? We dug deep (into a pint of ice cream) to research these little-known facts about one of America's favorite brands. Ben Cohen originally developed most of Ben & Jerry's flavors and Jerry made the ice cream batches. Ben has a rare sinus condition known as anosmia, which prevents him from being able to smell. He has said that he has no idea what flavors are, and has difficulty determining the differences in wines or spices, but he has a strong sense of mouth-feel and texture to compensate. Their only significant and long-running argument related to the size of the chunks to be included in their ice cream. Ben wanted large chunks while Jerry wanted small chunks since small chunks are easier to incorporate in the ice cream. They compromised by including a "large amount of large chunks," which people loved. Currently, Ben & Jerry's most popular flavor is Half Baked, which is chocolate and vanilla ice creams mixed with fudge brownies and gobs of chocolate chip cookie dough. Jerry's favorite flavor is Stephen Colbert's Americone Dream, vanilla ice cream with fudge covered waffle cone pieces and a caramel swirl. Ben's favorite used to be Cherry Garcia, cherry ice cream with cherries and fudge flakes, but he recently prefers the CORE flavors. Whenever Ben and Jerry are together, Ben told us that they "stand in order," so that Ben is on the left and Jerry is on the right. But, the two answer to each other's name. Stephen Colbert once joked that it's easy to remember who is who because "Jerry is hairy." Aside from the usual perks of good vacation and lifestyle, Ben & Jerry's offers its employees some really cool perks, including three free pints of ice cream per day. Once you stock your freezer, you can slide down the curvy slide in their main office and bring your canine best friend to work with you. In 1993, Ben and Jerry came to Ben & Jerry's Flavor Gurus and asked them to create a flavor called Wavy Gravy after the famous peace activist and entertainer. The Flavor Gurus asked Ben what the flavor should taste like and he said, "I don't know. But, it's called Wavy Gravy." They went through over 200 permutations and combinations before finally settling on the winner: a caramel, cashew, and Brazil nut ice cream with almonds and a chocolate hazelnut swirl. The ice cream was very popular but was retired to the Flavor Graveyard in 2001. Keeping in line with Ben & Jerry's tongue-in-cheek sense of humor, the company has built a Flavor Graveyard outside their Waterside factory, with tombstones that represent each of the retired ice creams in (mostly bad) rhyme, stuffed ravens, and plenty of kitsch. Initially, Ben & Jerry's did not do well in Japan because the Japanese did not understand why the ice cream was so full of chunks and would eat the ice cream and pick out the chunks. They preferred smooth ice cream and, of course, Ben & Jerry's focuses mostly on chunky ice cream. The company rethought their approach and installed a new Scoop Shop in 2012, which produces Japan-only flavors, in addition to selling some of Ben & Jerry's favorites, like Cherry Garcia. Over the years, Ben & Jerry's has brought out a variety of popular celebrity-endorsed and celebrity-inspired ice creams, including Stephen Colbert's Americone Dream, Jimmy Fallon's Late Night Snack, Ron Burgundy's Scotchy Scotch Scotch, Phish Food, and Liz Lemon's sorbet. Ben & Jerry's does not pay these celebrities to endorse the ice cream. Instead, the company provides a portion of the proceeds to the celebrity's charity of choice. As a bonus fun factoid, if you wind up in Waterbury, Vermont, you can take their factory tour. And, at the end of the tour, you can try a unique flavor only served at the factory tour. On the day I was there, I tasted "At the Chocobanana," a banana-cinnamon ice cream with brown sugar caramel swirls and milk chocolate chunks. It tasted exactly like freshly made banana-chocolate bread and I hope it goes into production soon!